Tessa doesn’t believe in magic. Or Fate. But there’s something weird about the dusty unicorn tapestry she discovers in a box of old books. She finds the creature woven within it compelling and frightening. After the tapestry comes into her possession, Tessa experiences dreams of the past and scenes from a brutal hunt that she herself participated in. 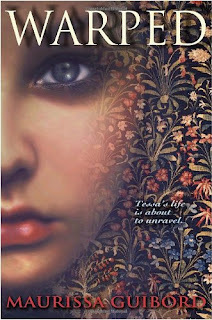 When she accidentally pulls a thread from the tapestry, Tessa releases a terrible centuries old secret. Dang. I was really looking forward to reading Warped when it came out, y’all. I started it almost immediately after it was released, couldn’t get into it, and set it aside. Then I saw a few good reviews that prompted me to pick it back up. Well, this time I at least did manage to finish it. Unfortunately, that’s about all I can say. It just wasn’t believable. Okay, okay. I know. You’re sitting there looking at your computer screen like “uh, brilliant observation Allison. The book about the Fates, unicorns and witches isn’t believable.” But that isn’t what I mean. I mean that the characters acted totally ridiculous in the situations they found themselves in. Tessa-of-the-16th-Century (I’ll call her N(ot) Q(uite) Tessa) is a young lady. The local nobility pays off NQ Tessa’s family so that they can use her for unicorn bait. See, they think this wild unicorn killed off one of them. (For the purposes of this scenario, we’ll forget about the fact that they’re completely wrong. )They need NQ Tessa because she is a virgin, which as we all know, is like a flashing “come and get it” sign to unicorns. So anyway, this maiden is sitting out in the middle of the forest trying to attract a killer unicorn…she is alone, but she knows plenty of big scary men are close by waiting to move in and kill it once it shows up. So then, all of a sudden….wait for it…. NQ Tessa: WTF? A DOG?!? You said you were out to get a killer unicorn! You didn’t say anything about bringing dogs! I’m scared of dogs! Does that strike anyone else as ridiculous? The group of big hunters? Fine. Killer unicorns? No biggie. But bring out the trained dogs? Now you’ve done it. Tessa, our modern day heroine, pulls a thread out of the unicorn tapestry, which makes 16th Century William appear in her bedroom. She decides to call for back-up. Tessa: Girl, this guy just fell out of that creepy unicorn tapestry hanging in my room. He is wearing medieval clothes…this is really weird. I bet I sound a little crazy, but I promise I’m not. Opal: hmm. Well, that does sound rather odd. But, of course I believe you. Be right over! uhh, hold it. I know you only have about 400 pages to tell your story so you don’t have time for a lot of theatrics with the whole getting-people-to-believe-you thing, but really. I’m gonna need a little more than that. So anyway, those are the two examples that stuck with me of situations I just couldn’t roll with in the story. Obviously I didn’t quote from the actual book, I just kinda paraphrased to get my point across. I wasn’t at all trying to imply that the author’s actual writing style was bad either. It just seemed like the plot was a little too much…and the characters just didn’t fit the story. Obviously this is just my opinion, because a lot of people loved the book! If I wasn’t so hung up on the characters, I’m sure I would have gotten caught up in the plot and found it very entertaining. Unfortunately, this just wasn’t the book for me. Bummer! I thought this was such a pretty cover, although I'll be honest and say I was much more interested in the cover than the story line… Maybe I'll give this one a pass. I haven't read the book yet, but I've ordered it and I am so sorry to hear you didn't like it! *sigh* It seemed so interesting with William de Chaucy travelling through the tapestry and all.